The Seahawks are Super Bowl Bound- Whoo hoo! Inspiration for an epic Seahawk Super Bowl Brunch is flowing in from all corners of the kitchen; see below for some awesome ideas to make your party perfect! One of my favorite brunch items is biscuits and gravy, especially on game day. Here is a simple recipe for my favorite scallion-cheddar biscuits as well as some spicy sausage gravy. In honor of the Hawks’, I’ll call them the 12th Man Big Nasty Biscuits with Sausage Gravy. My family likes to split the biscuits, lightly butter and toast under the broiler of the oven. Place the two big halves in the center of the plate and spoon the sausage gravy over the biscuits. Preheat the oven to 380° F.
In a large mixing bowl, combine the flour, sugar, salt, and baking powder. Cut the butter into the dry ingredients with a fork or pastry cutter. Fold in the grated cheese and scallions. Beat the eggs with the cream. Make a well in the middle of the dry ingredients and add the egg mixture. Mix until just combined; do not over mix the dough. Transfer the dough to a floured work surface. Roll out to about 3/4 inch thick. Cut into 3”- 4” rounds for the BIG NASTY. Transfer to parchment-lined sheet pan. Beat together egg and water, and brush biscuits with the egg wash. Bake in the oven for about 15 minutes, lower the temperature to 340°F, and bake for another 10 minutes, or until golden brown. Cook sausage in a large skillet breaking up the sausage into pieces until golden brown, about 8-10 minutes. Reserve until sauce is complete. In a medium saucepan, heat the butter over medium – low heat until melted. Add the flour and stir until smooth. Over medium heat, cook until the mixture turns a light, golden color, about 6- 7 minutes. Meanwhile, heat the milk in a separate pan until just about to boil. Add the hot milk to the butter mixture 1 cup at a time, whisking continuously until very smooth. Bring to a boil. Cook 10 minutes, stirring constantly, then remove from heat. Season with salt and nutmeg, and fold the loose sausage into the sauce. Set aside until ready to spoon over warm split biscuits. No game day is complete without the proper beverages and a great Bloody Mary is the perfect compliment to the biscuits and gravy. In light of our upcoming opponent, we renamed our famous Pomegranate Bistro Bayou Bloody Mary to Bloody Broncos. It’s the exact same recipe that you would get any weekend here at the Bistro. For more Bloody Mary inspiration, check out one of my favorite magazines, Garden & Gun, for awesome tips and tricks for building the perfect Bloody Mary bar. Moisten the rim of a pint glass with lime juice, then press in Old Bay Seasoning and Maldon Sea salt to coat rim. Fill the pint glass with ice, then add the House Pepper Vodka. Top with the POM Bloody Mary Mix and add garnish. In a large glass jar with a seal-able lid, combine the vodka, bell peppers, and jalapeño. Seal and let stand for 3 days; gently shake the jar each day. After 3 days, strain and store in seal-able bottles. Combine V8 juice, Bloody Mary seasoning, Worcestershire sauce, horseradish, lemon juice, lime juice, hot pepper sauce, salt, and pepper. Can be stored in refrigerator up to 3 days. And while supplies last, check out Hilliard’s 12th Can for a perfect NW flavored game day brew … One of our favorites here at the bistro. Baking a pie from scratch requires patience, care, and lots of love. Making a gloriously golden, flaky crust often requires 2 times more of the above! We’re sharing Lisa’s pie crust recipe from her cookbook Fried Chicken & Champagne to help set the foundation for many of your favorites – apple, pumpkin, pecan, banana cream – whichever suits your fancy! In a small bowl, stir together the salt, cider vinegar, and cold water. Place the butter and flour in the bowl of a food processor fitted with the blade, and set in the freezer for 10 minutes, until butter is chilled but not frozen. Re-position the bowl on the food processor, and pulse the butter and flour mixture until it resembles pea-size balls. Add the water mixture and pulse just until the dough comes together; if the dough gets warm or is worked too long, it will toughen. Divide the dough into 2 equal balls. With your hand, flatten the balls into discs. Wrap each disc with plastic and refrigerate for 2 hours or overnight; you can wrap the extra dough well and store it for another time—about 1 week in the refrigerator or 1 month in the freezer. If you have a pizza stone, place it in the lower third of the oven. Preheat the oven to 450°F for at least 30 minutes. Spray a 9-inch pie pan with nonstick spray. Carefully roll out 1 ball of dough to a 12-inch circle (or 1 inch larger than your pie pan); the dough should be about 1/8 inch thick. Gently press the dough into the pan and trim or crimp the edges with a fork. Freeze for 30 minutes. Line the pie pan with parchment or a paper coffee filter and fill with pie weights or dried beans. Bake directly on the pizza stone for 10 to 12 minutes, or until the edges are golden brown. Remove from the oven, and gently remove the pie weights; you may need to return the shell to the oven briefly to crisp up the center. Cool the baked pie shell at room temperature. [u]Legal cheat[/u]: Use a large round coffee filter to line your pie crust before adding pie weights. It’s already round and easier than cutting parchment. Earlier this month we held a pie recipe contest with 425 Magazine in spirit of Thanksgiving and we selected Jonathan Shipley’s recipe for Cranberry-Apple Pie with cheddar crust as our contest winner! We chose Jonathan’s recipe for it’s unique twist on the classic apple pie; Our pastry chef Rebecca was excited to make the cheddar crust as it isn’t oft used! Rebecca started with the filling, coring and peeling tart, Washington apples (Granny Smith is her preferred baking apple) and mixing all the spices with fresh cranberries. The cheddar crust is simple in ingredients, but Rebecca looked forward to tasting how the savoriness of the cheddar balanced with the tartness of the apples and cranberries! After adding some adorable final touches to the top of the crust, we baked for approximately 45 minutes until the crust was golden brown with cheddar goodness. There’s no better time of year to indulge in one of our holiday season favorites – Chocolate Bourbon Pecan Pie. Topped off with cinnamon spiced whipped cream, we hope this decadent dessert convinces you and yours to save room after Thanksgiving dinner! Ginger Molasses Cookies – a holiday favorite! 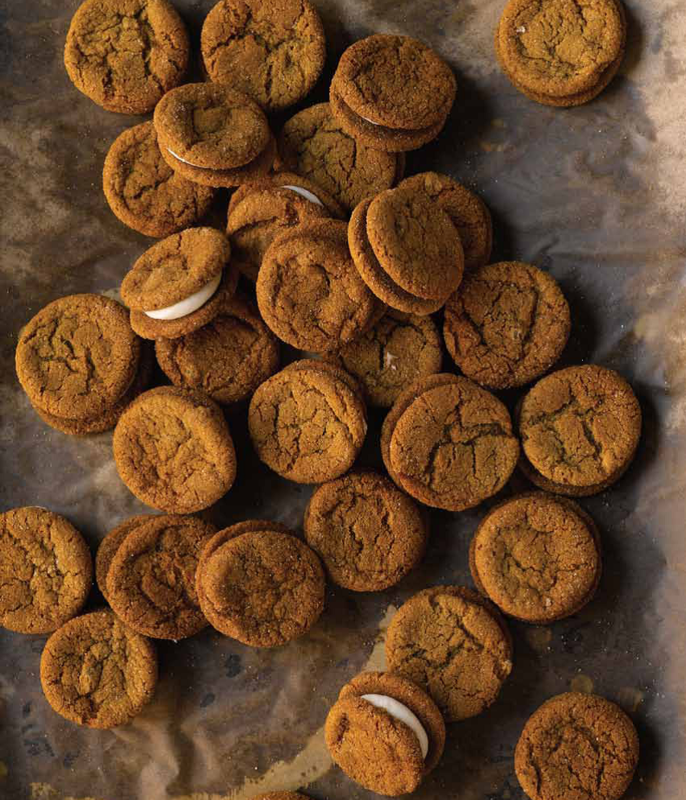 It’s the perfect time of the season to share one of everybody’s favorite cookie recipes from Lisa’s Fried Chicken & Champagne cookbook! [u]To make the cookies[/u]: In the bowl of a standing kitchen mixer with the paddle attachment, whip the butter, brown sugar, and sugar at medium speed until creamy and smooth. Add the egg, molasses, honey, vanilla extract and freshly grated ginger root and continue to mix until smooth. Scrape down the bowl and whip for 1 minute at medium speed. In a separate bowl, sift together the pastry flour, baking soda, cinnamon, powdered ginger, cloves, nutmeg, and pepper. Add the dry ingredients to the butter-molasses mixture and mix well, scraping down the bowl several times with a rubber spatula. Refrigerate dough for 1 hour. It’s best overnight. Scoop the cookies into 1-inch balls with a small ice cream scoop, and chill until ready to bake. When ready to bake, preheat the oven to 350°F. In a small bowl, cinnamon and sugar until well mixed. Remove cookie dough from refrigerator and roll the balls in cinnamon sugar, place onto parchment-lined sheet pans. Bake until just barely done, about 7 to 8 minutes. They will be slightly cracked on top. [u]To make the filling:[/u] In the bowl of a standing kitchen mixer with the whip attachment, whip cream cheese, powdered sugar, and vanilla until smooth. Set aside. When the cookies are cool, turn half of the cookies upside down. Place 1 to 2 teaspoons of filling, in a large dot, at the center of each cookie. Place the other half of the cookies on top, creating little sandwiches. My husband, Jonathan, is an amazing baker and pastry chef. One of the coolest memories I have is of him getting up extra early on Christmas morning to bake these cinnamon rolls for the family. You can start them the night before and form the rolls, then let them rise the morning you plan to serve them . Prepare a sheet pan or baking dish by lining with parchment paper and spraying with nonstick cooking spray. To make the dough: In the bowl of a standing mixer, stir together the warm milk, yeast, and sugar by hand. Let stand still for 5 minutes. Add the flour, salt, butter, and eggs. Using the dough hook, mix to completely develop the dough, about 8 to 10 minutes (the dough should “clean” the side of the bowl, with no extra flour at the bottom; you might need to add more flour). The finished dough will be tacky but not sticky. Remove the dough hook and cover the bowl with plastic. Place the bowl in a warm area and allow the dough to double in size. To make the honey butter: In a medium-size mixing bowl, stir together the honey and the butter until completely mixed. To make the cinnamon sugar: In a small mixing bowl, stir together the sugar and cinnamon until completely mixed. Place the dough on a lightly floured surface. Roll out into a rectangle that is roughly 18 inches by 24 inches and about 1/2 inch thick. Liberally brush the dough with half of the room-temperature honey butter. Sprinkle with the cinnamon-sugar mixture. Beginning with the 24-inch side of the dough, start rolling from the bottom up to the top of the rectangle. Gently pull the dough to make an even, semi-tight spiral. Divide the “log” by cutting it in half, and then in half again, with a serrated knife. Divide each quarter into 5 pieces. Lay each piece on its side. Take the “tail” of the first piece and gently pull and wrap it around, tucking it under the roll. Press down slightly on the roll and place it on the sheet pan. Continue with the rest of the rolls. Start the day before and that will make it easy Christmas morning to bake warm cinnamon rolls. I have inserted the method below for finishing the baking the next day. Press down slightly on the roll and place it on the sheet pan. Continue with the rest of the rolls.Wrap the pan in plastic and refrigerate overnight. First thing in the morning, pull the cinnamon rolls out and let them sit covered with a cloth on top of your stove or another WARM place to rise for 2 hours. It is important that they are warm or they won’t “proof” (rise) properly. Preheat the oven to 350°F. Bake the cinnamon rolls for 15 to 20 minutes, or until they are a deep golden brown, rotating the pan halfway through. Remove from oven and lightly brush with reserved honey butter. Cover and place the rolls in a warm area and let them rise again. To make the icing: Place cream cheese and butter in the bowl of a standing kitchen mixer, and mix until smooth at low speed. Add the powdered sugar, cream, and vanilla, and whip until smooth. When the rolls are completely cool, ice them. Serve them cool or warmed in the oven at 325°F for 2 to 3 minutes. Chef Lisa Dupar along with her team at Lisa Dupar Catering and Pomegranate Bistro have been nurturing the Seattle community through food for nearly 30 years. Our blog features behind-the-scenes looks into our events and operations as well as tips and tricks of the trade. Cheers yall!